Teledyne Instruments patented Quick Sensor is a pre-fabricated Torque & Thrust Strain Bridge that is applied to a shaft much the same way as a strain gage. This time-saving device was developed for the Nuclear Power Industry to reduce the time and effort required to install strain gages in a radioactive environment. Since it's introduction in Nuclear Plants, the Quick Sensor has become popular in many other industries and applications where gaging time and cost is a concern. The Quick Sensor has strain gages, circuitry and pre-wired connectors, all installed on a thin stainless steel backing which is then adhesed to the shaft. 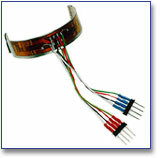 With proper installation and removal techniques, test engineers have found that the Quick Sensor is re-usable. This procedure affords the user even more cost savings.